I’ve been following collectible card games (CCG’s) on the App Store for about a year now. This is an interesting subset of the strategy genre of mobile gaming, which has established a stronghold in East Asia and begun encroaching into Western markets. 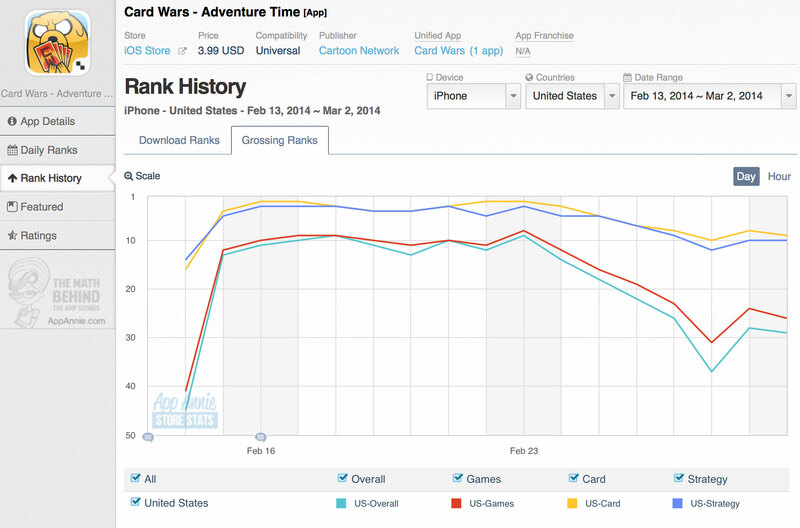 Only a handful of of card games have achieved success in the West, but I noticed an interesting one based on an American cartoon on Adult Swim that quickly moved up the Free and Top Grossing charts after release: Card Wars – Adventure Time. When I downloaded it, it was ranking within the top 10 grossing apps on iPhone which is quite an achievement for $3.99 collectible card game based on an American IP. This has happened once before with a Marvel-themed CCG, but is otherwise very unusual. As a general rule, for-pay apps rarely have shots at the top position on grossing charts, but when they do, it’s almost always very short lived. 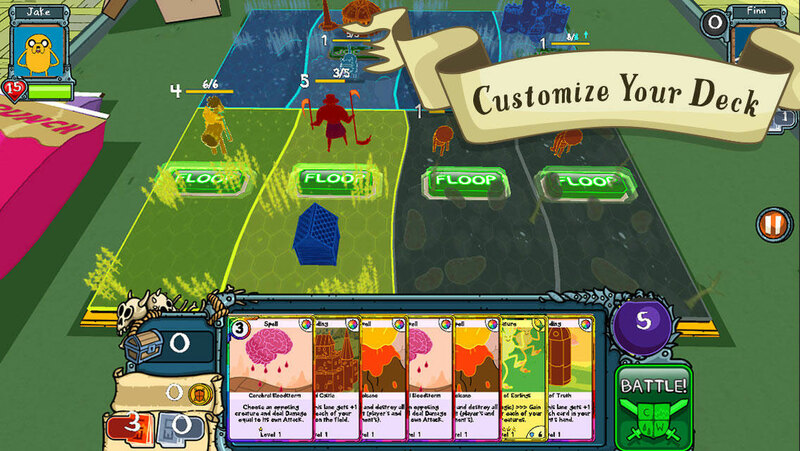 Select cards to create a deck which you battle against an opponent, turn by turn. It works almost exactly like Magic: the Gathering, with creatures, spells, and building that you can summon. You can fuse cards together to create new cards, which adds a lot of depth and replay-ability to the game. Each card has a special ability called “Floop” which can be triggered during your turn, casting spells and effects on your enemy. With dozens and dozens of PvE points immediately visible on the game map, the amount of content here is overwhelming. I believe that users would have benefited from hiding the later stages of the single player game – I’ve been playing for about 10 hours and I’d estimate I’m at 20% completion. Automatically complete battle sequences, moving combat strategy to deck preparation. Battles are on auto-pilot. Require manual battle instructions, adding strategy to the combat sequence. There are benefits and drawbacks of each option, but as a generalization, the former is a contemporary casual mechanic which monetizes better and the latter is a traditional staple of real card games like Magic. I personally prefer the latter, in the style of Magic: the Gathering, so Card Wars provides challenging and engaging gameplay. 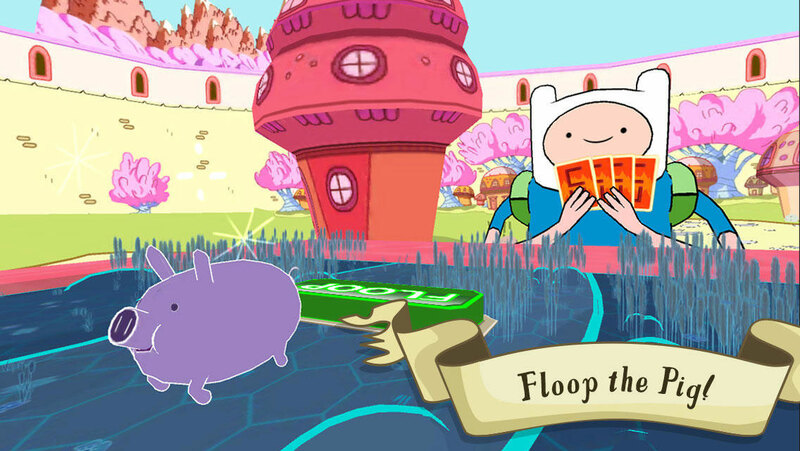 The cartoon art style keeps it feeling lighthearted, and characters from Adventure Time are all faithfully reproduced here (although I haven’t seen much Adventure Time, I understand that this card game is depicted in the show). Some very strange decisions were made with Card Wars’ monetization system, but I’m reluctant to call them a major problem since the game has performed well so far. I would expect a freemium CCG (that is, a free-to-download game with in-app purchases) to perform better than for-pay since the IAP model allows you to monetize buyers so many more times. However, Card Wars goes for what is a reasonably high up-front price for the App Store at $3.99, and then hits you up for consumable IAP like Gems and Hearts (which in this game are energy). A major missing component to this game is multiplayer. I have not seen any option to play with other players, either through selection or randomization. Without PvP (player versus player) functionality I feel like I’m building up my decks and have no chance to test them against calculating opponents. Paying players really need a way to show off their decks, which brings me to the next thing lacking: social features. One could argue that because their primary monetizer is the up-front purchase cost, features like social and PvP aren’t essential to this game. But I disagree because this is, after all, a board game – it was made for multiplayer. I had no reservations about paying $3.99 for this game, and I have not regretted it since purchasing. I think Card Wars could be even more successful if it were free and monetized entirely with in-app purchases, although I don’t think there’s any doubt that a change of that magnitude would absolutely require the missing multiplayer and social components. Although the presence of consumable energy in a for-pay game bugs many people, myself included, it hasn’t presented much of an obstacle. Unless you play Card Wars for hours in a single sitting, you’re likely to meet that restriction. In the end, there’s little chance of me convincing many friends to check this out because the game is neither free nor offers the option of playing against a friend. The $3.99 cost of entry is steep for someone dipping their toes into CCG, but if you know you like this type of game or watch Adventure Time, I think you’ll love it.